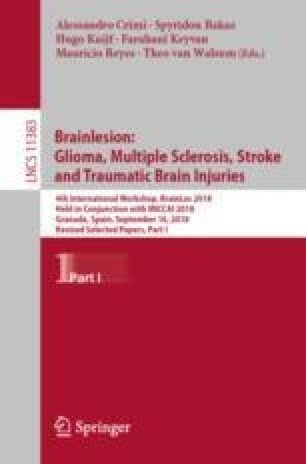 Stroke is an important neuro-vascular disease, for which distinguishing necrotic from salvageable brain tissue is a useful, albeit challenging task. In light of the Ischemic Stroke Lesion Segmentation challenge (ISLES) of 2018 we propose a deep learning-based method to automatically segment necrotic brain tissue at the time of acute imaging based on CT perfusion (CTP) imaging. The proposed convolutional neural network (CNN) makes a voxelwise segmentation of the core lesion. In order to predict the tissue status in one voxel it processes CTP information from the surrounding spatial context from both this voxel and from a corresponding voxel at the contra-lateral side of the brain. The contra-lateral CTP information is obtained by registering the reflection w.r.t. a sagittal plane through the geometric center. Preprocessed training data was augmented during training and a five-fold cross-validation was used to experiment for the optimal hyperparameters. We used weighted binary cross-entropy and re-calibrated the probabilities upon prediction. The final segmentations were obtained by thresholding the probabilities at 0.50 from the model that performed best w.r.t. the Dice score during training. The proposed method achieves an average validation Dice score of 0.45. Our method slightly underperformed on the ISLES 2018 challenge test dataset with the average Dice score dropping to 0.38. J. Bertels is part of NEXIS, a project that has received funding from the European Union’s Horizon 2020 Research and Innovations Programme (Grant Agreement #780026). D. Robben is supported by an innovation mandate of Flanders Innovation & Entrepreneurship (VLAIO).